Welcome to the most high vibe of all "free from" pumpkin pies! It's made with simple, wholesome ingredients like coconut milk, maple syrup, oats and... brandy? Yep! Brandy! My goal with this pie was two fold. Make it gluten free, vegan, nut free, soy free, and gum free. (Because everyone deserves pumpkin pie.) But, my friends, we're not so dull as to define a wondrous treat by what it isn't, are we? My second goal was, of course, make it the best damn vegan gluten free pumpkin pie that exists. This pie isdecadent, thick, creamy and custardy. The crust is crisp, nutty and insanely easy. 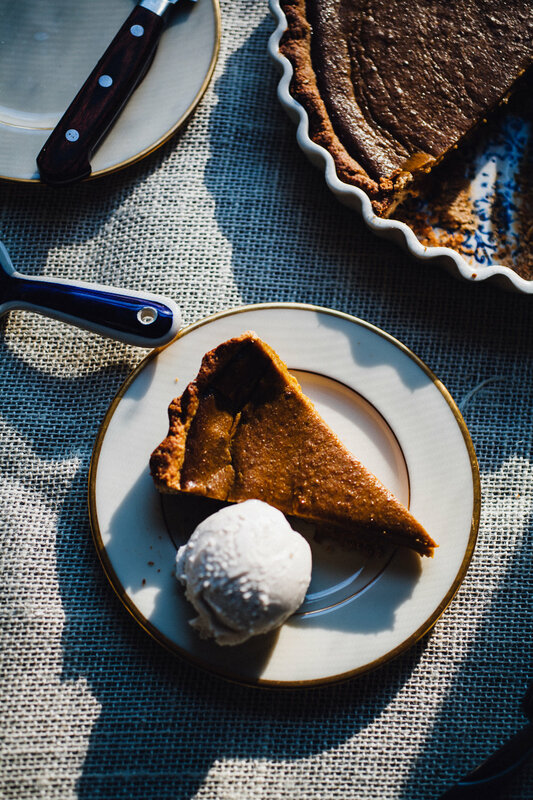 The pie as a whole has a brown-sugar depth from the maple syrup and coconut sugar, which caramelize during the cooking process. And it's spiced with hawaij, a yemeni spice blend made up of ground cardamom, ginger, clove, cinnamon and nutmeg. Aka pumpkin pie spice on steroids. My sweet and talented friend Molly Yeh posted some gorgeous hawaij coffee doughnuts last week. I mean, that spice blend is full of all of my favorite things. So you know I had to try it out! And dudes! It's magic. It's sweet and aromatic. But also warm and grounded. It's the perfect complement to the creamy-sweetness of this pumpkin pie filling. On top of that, I've added brandy and hella vanilla extract. Because I like my flavors amped up. Brandy adds depth and a heavenly aroma (don't worry the alcohol cooks off completely mostly... see update at the bottom of the post). A pinch of salt brings out the natural sweetness in the coconut milk and pumpkin. Chia! Not just chia though. Powdered chia! Powdered chia thickens the pie filling as it's cooking. You'll notice how the filling starts to pull away from your spatula as it cooks down. How it becomes thick like an egg custard. Just like chia pudding. The powdered chia in the filling is what makes this dessert truly like a traditional pumpkin pie. I admit, it's pretty mind-blowing to cut into it! It acts, looks and tastes just like the classic version! I did many a happy dance after taking the first bite. Oh god it's good! Indeed. I rely on coconut milk heavily for many of my recipes. There's simply nothing as delicious and good for you as full fat coconut milk, cream and water. Does it taste heavily of coconut? Not at all! The pumpkin and spice-blend mask most of the coconut flavor. Here's the twist with the vegan gluten free pumpkin pie process. After baking, it's going to look very dark. Logan thought it was a chocolate pie when I pulled it out of the oven! But not to fear! Cool the pie completely on the counter. Then let the pumpkin pie cool in the fridge, ideally overnight. A minimum of 3 hours. Once it cools it regains its golden, glowing pumpkin color. Not to mention that the custard thickens significantly once chilled. Serve with ice cream. Or coconut whip. Seriously tho. After all of that work, you gotta serve it in style! Notes: I find canned pumpkin is the best for this filling recipe as it's already perfectly smooth. If you want to use fresh roasted squash make sure it's pureed REALLY smoothly. Add the oats to the bowl of a high powered blender. Grind until you have a semi-fine flour. Add the sunflower seeds, coconut oil, maple syrup, salt and cinnamon. Blend until it comes together into a smooth, pliable dough. Scoop the dough out of the blender out into a 9" pie or tart pan. Using your hands, press the crust into the pan evenly. You want the crust to go all the way up the sides of the pan to form the "wall" of the crust, but not over the edges of the pan. Prick holes all over the crust. Bake for 15 minutes, rotating half-way through, until golden. Once baked, remove from the oven and set aside to cool slightly. While the crust is baking, in a medium sauce pot, whisk together the pumpkin custard ingredients: pumpkin puree, coconut milk, maple syrup, coconut sugar, powdered chia, brandy, vanilla, cardamom, ginger, clove, cinnamon and nutmeg. Stir everything together until smooth. Place the mix over medium high heat. The mixture will smooth out more as it cooks. Cook, stirring relatively constantly and scraping down the sides of the pan, until reduced by half of the original volume. This takes roughly 20-25 minutes. Once done, the filling will coat the back of a spoon thickly. Pour the pie filling into the pie crust, smoothing out the top with a spatula. Bake at 350F for 25 minutes. The filling will thicken and turn a dark brown color. Remove the pie from the oven and let cool on the countertop to room temperature. Then place the pie in the fridge to chill for a minimum of 3 hours, ideally overnight. The pie will be firm and golden orange when it's ready. Slice into your pie and enjoy! Best served with coconut whip or a la mode.